We’d love your help. 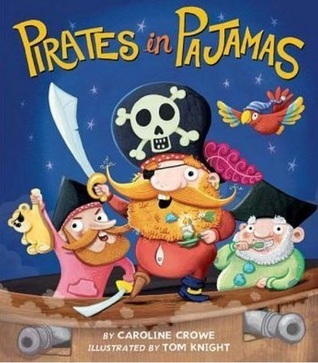 Let us know what’s wrong with this preview of Pirates in Pajamas by Caroline Crowe. 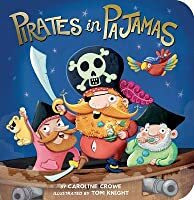 Pirates in Pajamas is a hilarious rhyming romp – perfect for bedtimes and little pirates everywhere. Beautifully illustrated by Tom Knight, this book is packed full of piratey humour, jazzy jim-jams and a cosy-dozy ending. Bedtimes will never be boring again with this fantastic first picture book from Caroline Crowe. 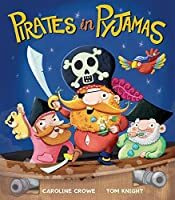 Perfect for fans of Aliens Love Underpants and The Pirat Pirates in Pajamas is a hilarious rhyming romp – perfect for bedtimes and little pirates everywhere. 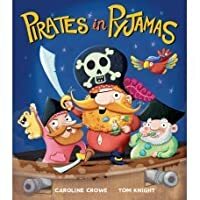 Beautifully illustrated by Tom Knight, this book is packed full of piratey humour, jazzy jim-jams and a cosy-dozy ending. Bedtimes will never be boring again with this fantastic first picture book from Caroline Crowe. Perfect for fans of Aliens Love Underpants and The Pirate Cruncher. To ask other readers questions about Pirates in Pajamas, please sign up. Again... so many white dudes! How about some lady pirates up in here? But a really cute read aloud. Would be a fun one to read during story time - stinky cheese, bare bottoms, rhyme, and pirates in a multitude of pajamas. Pure silliness that your children will enjoy listening to and seeing just before going to bed. Cleanliness: it does not show it, but a pirate's drawers fall open in the back. **Like my reviews? I also have hundreds of detailed reports that I offer too. These reports give a complete break-down of everything in the book, so you'll know just how clean it is or isn't. I also have Clean Guides (downloadable PDFs) which enable you to clean up your book before reading it! Visit my website: The Pure silliness that your children will enjoy listening to and seeing just before going to bed. Great text, disappointingly homogeneous illustrations. I think this would be a good book to have in the classroom. I think you could use it for description, there is quite a bit in it. SUMMARY: Two boys wonder if pirates wear black and white pajamas with skull and crossbones. No, this story says. Pirates wear a variety of creative styles and colors to bed. They also have some zany bedtime routines! ILLUSTRATIONS: The illustrations are large, colorful, fun, and full of hilarious details. You have to read through this book multiple times to catch all the visual fun. REVIEW: I am an extreme lover of pirate picture books so of course I had to read this one. And FINALLY, I was met wi SUMMARY: Two boys wonder if pirates wear black and white pajamas with skull and crossbones. No, this story says. Pirates wear a variety of creative styles and colors to bed. They also have some zany bedtime routines! REVIEW: I am an extreme lover of pirate picture books so of course I had to read this one. And FINALLY, I was met with a picture book that rhymes so smoothly, I wanted to read it over and over! This book was full of laugh out loud humor as the pirates prepare for bed. From their shark fin hairstyles in the bath to the captain's too small pajamas (causing a belly button to peak out) and the wardrobe malfunction of one pirate who laughed too loud, this book is fun from start to finish. The zany and unique pajamas each pirate wears is wonderful! This book definitely shows the softer side of pirates which makes it perfect for the youngest crowd. But the hilarious and silly fun makes it perfect for the older crowd and independent readers. We loved this book so much! It was a cute little read that let our kids know that you don't have to have skulls and stripes on your pajamas to be a pirate. We also loved the illustrations showing how pirates can have the same bedtime routines, that can also be fun and silly. Follow Captain Redbeard and his crew as they get ready for bed. They splash in the bubble bath, dry behind their ears, wear their favorite pajamas, have a pillow fight, and drink milk. I love the wide variety of silly pajamas represented. This would be a perfect book to read to a Kindergarten or first grade class. My toddler loved reading it with his father. Silly rhyming tale that's perfect for reading before bedtime. Funny! Great big illustrations for story time! This will be fun in storytime! Cute rhymes and bright illustrations. This book is super cute! I want to make little flannels with all their pajamas. It would be great to include in a pirate-themed storytime or a pajama one...adorable. Good rhymes and bold illustrations. Perenially popular theme of pirates, and the mention of stinky, mouldy cheese and a bare bottom are just what small children find hilarious!